In What Conditions of Water Does Algae Grow? There's nothing more relaxing than sitting back and watching your fish swim in the clear water of your backyard pond or indoor aquarium. But if you've owned a pond or aquarium for more than a few months, then you've probably noticed how quickly the edges can be covered with algae, and how cloudy the water gets. Understanding the water conditions that prompt the growth of algae can help you to slow it down and even prevent it. There are many types of algae, and it's important to remember that some algae is normal in any tank or pond. According to Clear Waters Aquarium, your tank will develop green, hair-like algae. The presence of red or brown algae can indicate a water quality problem. Algae is a plant-like life form that can grow and replicate. Because it's a plant, algae requires light, water, and nutrients in order to grow. All of these conditions are found in your typical aquarium, pond, or other body of water. While some algae is beneficial for your tank, serving as a food source for some fish and organisms, too much algae, called an algae bloom, can make for an unhealthy environment. Algae needs light to survive, and in many cases, you supply that light by placing lamps above fish tanks. Ponds in open areas with relatively little shade are also prime environments for algae growth. Clear Waters Aquarium recommends that you minimize the amount of light your fish tank receives by only leaving the aquarium light on for 10 hours per day. Hooking your light up to a timer can make this regulation easier. 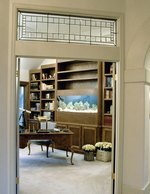 If your fish tank is near a window, move it away from the location so that it doesn't receive natural sunlight throughout the day. It may be great fun to feed your fish and watch them delight in catching pieces of food, but excessive feeding will quickly contribute to water algae growth. Doctors Foster and Smith note that algae thrives on uneaten fish food, as well as fish waste. In fact, overfeeding your fish can create ammonia and phosphate, the nutrients that algae require to grow. To keep the nutrients in your tank to a minimum, feed your fish just once a day, or feed them smaller portions two or three times a day. Only feed as much food as your fish will eat at one time. 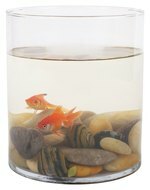 Using an appropriate water filter can help to remove the fish waste by reducing the nutrition present in the tank. The temperature also plays an important role in algae growth. You may notice that pond algae tends to increase dramatically with warmer summer weather. According to the New York Times, summer weather is accompanied by plenty of sun. This sun and warmth powers photosynthesis, prompting algae growth and blooms. When the light and temperature decrease in the fall, the algae growth decreases. Lower temperatures slow the growth of algae. According to Healthfully, algae thrives in water with high pH levels between seven and nine. For most algae growth, an optimum pH is between 8.2 and 8.7. A pH level that is neutral or lower can help decrease the growth of algae. When you're working with a pond or aquarium containing fish or other animals, then you really need to maintain the pH at a level appropriate for the animals. It's best to rely on the other methods, such as reducing available nutrients and reducing light, to help regulate algae growth. Dealing with water algae growth can be frustrating, but as you get to know your tank or pond, you'll figure out how you can best regulate algae and keep it in check.